Hi-Rez Studios’ latest title, Realm Royale, proves that there's still more room in the battle royale bandwagon. Realm Royale is set in the same universe as Hi-Rez’s free-to-play, 5-vs.-5, team-based shooter Paladins and takes the tried-and-true battle royale formula for a fantasy-themed spin. Unlike Fortnite and PUBG, Realm Royale features five unique player classes: Assassin, Engineer, Hunter, Mage, and Warrior. Each with abilities that seasoned Paladins players may recognize from some of their favorite champions. Here’s everything you need to know about Realm Royale and all the weapons currently available! There are two main focuses to every Realm Royale match: collect loot and kill 'em all. Each Realm Royale match includes 100 players, so there’s a lot of looting and killing to be done. It's not reinventing the wheel but you can ride horses, which lends to the game’s fantasy MMO world feel. Armor, weapons and other items can be found in chests located throughout the map and can also be crafted using a resource called Shards. Shards can be looted from enemy players or created by disenchanting unwanted weapons, abilities and other items. You can carry a maximum of 200 Shards at a time, so it’s important to head to the Forge if you’re getting close to the cap. When a player is defeated in Realm Royale, they will turn into a vulnerable chicken. Yes, a literal chicken. If they manage to survive for thirty seconds in poultry form, they’ll respawn with all of their items. Plucked and living to fight another day. Unfortunately for the birds, you'll need to kill them to obtain a Chicken Trophy, a key crafting component for creating the game’s most powerful weapons. Sorry, chickens. Get good. 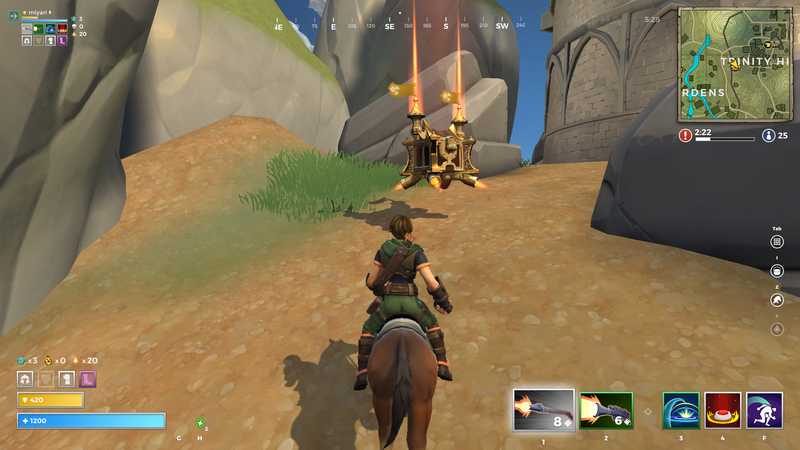 There’s no worrying about ammo or durability in Realm Royale—every weapon can be used indefinitely. You can hold a total of two weapons and any unwanted weapons you come across can be easily disenchanted for Shards. Before you jump to immediately disenchanting an item, you might consider passing weapons on to your teammates. Basic Chest: Contains weapons, armor, and other items. Weapons Chest: Contains only weapons. Potion Chest: Contains only potions that restore health or armor. There is also a Gold Chest which, similar to Fortnite's Supply Drops, occasionally fall from the Zeppelin and landing somewhere on the map. You can see the location of the Gold Chest on the map (it's the gold chest icon, big surprise) and two orange beams shooting from the chest into the sky are noticeable when you're close. Gold Chests contain Legendary quality weapons, and even have a chance to contain your class-specific Legendary weapon! Each chest features a distinctive visual appearance, so it’s important to focus on getting your hands on those weapon and armor caches quickly and efficiently. You may consider landing in or near buildings that can contain chests, potentially a great advantage early in the game. They’ll likely be hotly contested, though, so it’s best not to go alone. 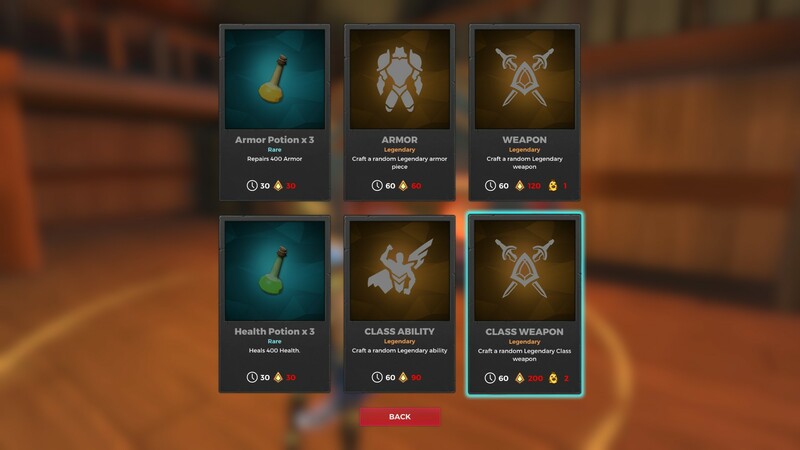 Weapons in Realm Royale use the tried-and-true color-coded rarity system seen in games like Fortnite, Borderlands, and World of Warcraft. There are a total of four different weapon rarities: Common (White), Rare (Green), Epic (Purple) and Legendary (Orange). Obviously, a weapon of a higher quality is considered an upgrade. Fire: Burns enemies for extra damage (20 damage every 0.2 seconds for 1 second) and reduces healing received on the target by 50% for as long as they're on fire. Frost: Inflicts a 50% slow effect on the target. Lightning: Reveals enemies through stealth and walls to you and your team. Here’s a list of all of the weapons you’ll find in the game. To make this list easier to read, we’ve abbreviated the following terms: “Shots per second” is “SPS,” and “Damage per second” is “DPS.” Note that, as the game is currently in Early Access, values are subject to change. We will try to stay up-to-date to the latest game version. It's worth noting that headshots dealt with any weapon will deal doubled damage. The Shotgun and Sword are hitscan weapons, meaning that where you click is where you’ll hit. The Crossbow, Poison Pistol, Slug Rifle, Heirloom Rifle and Revolver are all projectile-firing weapons, and as such can be a bit more difficult to aim due to the game's small projectile sizes (all non-class weapons now have the same size projectiles). The Crossbow fires projectiles and can hold 8 shots, requiring 1 second to reload. It's best used in close-range combat, as the weapon’s strengths falter greatly when attempting to use at range. The Crossbow has a surprisingly high rate of fire and can be a decent alternative to the Revolver as it has perfect accuracy. Crossbow (Common): 310 Damage, 2.5 SPS, 775 DPS. 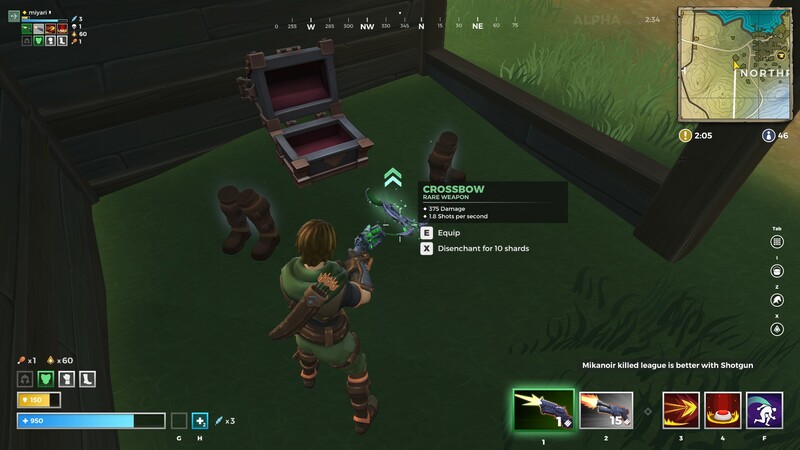 Crossbow (Rare): 370 Damage, 2.5 SPS, 925 DPS. Crossbow (Epic): 430 Damage, 2.5 SPS, 1075 DPS. Crossbow (Legendary): 500 Damage, 2.5 SPS, 1250 DPS. The Revolver is a projectile weapon that can hold 6 shots, requiring 2.4 seconds to reload. It is a good, all-purpose weapon, though its limited effective range will typically limit it to being a secondary option, as it suffers pretty significant damage falloff at high range. It’s still a great close-range weapon choice. Revolver (Common): 500 Damage, 1.39 SPS, 694 DPS. Revolver (Rare): 550 Damage, 1.39 SPS, 764 DPS. Revolver (Epic): 600 Damage, 1.39 SPS, 833 DPS. Revolver (Legendary): 650 Damage, 1.39 SPS, 903 DPS. The Assault Rifle is a hitscan weapon that can hold 25 shots, requiring 2.5 seconds to reload. It fires ten of these shots in a single second, with the potential to deal extremely high burst damage if you manage to land the shots. The damage spread is a little unforgiving, but if you're close enough to your target expect to deal some serious hurt. Assault Rifle (Common): 80 Damage (per shot), 10.0 SPS, 800 DPS. Assault Rifle (Rare): 90 Damage (per shot), 10.0 SPS, 900 DPS. Assault Rifle (Epic): 100 Damage (per shot), 10.0 SPS, 1000 DPS. Assault Rifle (Legendary): 110 Damage (per shot), 10.0 SPS, 1100 DPS. The Burst Rifle is a projectile weapon that can hold 8 shots, requiring 1.5 seconds to reload. The Burst Rifle fires three bullets per shot and deals decent close-range damage, suffering no damage falloff. Again, its effectiveness is totally dependent on range. Burst Rifle (Common): 600 Damage (per triple shot), 2 SPS, 1200 DPS. Burst Rifle (Rare): 660 Damage (per triple shot), 2 SPS, 1320 DPS. Burst Rifle (Epic): 720 Damage (per triple shot), 2 SPS, 1440 DPS. Burst Rifle (Legendary): 780 Damage (per triple shot), 2 SPS, 1560 DPS. The Slug Rifle fires projectiles and can hold 6 shots, requiring 1.5 seconds to reload. While the Slug Rifle packs a decent punch, its lower range and lower rate of fire make it slightly weaker than its medium-range chum, the Heirloom Rifle. However, the weapon features perfect accuracy, so if your aim is good expect to land those huge hits. Slug Rifle (Common): 565 Damage, 1.11 SPS, 628 DPS. Slug Rifle (Rare): 610 Damage, 1.11 SPS, 678 DPS. Slug Rifle (Epic): 655 Damage, 1.11 SPS, 728 DPS. Slug Rifle (Legendary): 710 Damage, 1.1 SPS, 789 DPS. The Heirloom Rifle is a projectile weapon that can hold 10 shots, requiring 2.3 seconds to reload. It shines in mid to long-range use like any good rifle should. This weapon is a great secondary choice for classes with close-range Legendary weapons, including Engineer and Mage. Heirloom Rifle (Common): 280 Damage, 2.5 SPS, 700 DPS. Heirloom Rifle (Rare): 305 Damage, 2.5 SPS, 763 DPS. Heirloom Rifle (Epic): 330 Damage, 2.5 SPS, 825 DPS. Heirloom Rifle (Legendary): 355 Damage, 2.5 SPS, 888 DPS. The SMG is a hitscan weapon that can hold 25 shots, requiring 2.2 seconds to reload. It is an automatic weapon that fires all of these shots at once, capable of dealing incredibly high potential burst damage. Similar to the Assault Rifle, the damage spread can be difficult, but generally speaking you can deal relatively easy damage by spraying and praying. SMG (Common): 75 Damage (per shot), 15.15 SPS, 1136 DPS. SMG (Rare): 82 Damage (per shot), 15.15 SPS, 1242 DPS. SMG (Epic): 90 Damage (per shot), 15.15 SPS, 1364 DPS. SMG (Legendary): 100 Damage (per shot), 15.15 SPS, 1515 DPS. The Shotgun is a hitscan weapon that can hold 5 shots, requiring 2.6 seconds to reload. As expected, the Shotgun excels in close-range combat and generally shouldn’t be used for long-range encounters. Shotgun (Common): 690 Damage, 1.25 SPS, 863 DPS. Shotgun (Rare): 750 Damage, 1.25 SPS, 938 DPS. Shotgun (Epic): 810 Damage, 1.25 SPS, 1013 DPS. Shotgun (Legendary): 870 Damage, 1.25 SPS, 1088 DPS. The Sword is a sword (technically hitscan) and as such does not require ammunition, nor must it be reloaded. Because it is a sword. You don't reload swords. Obviously, this weapon caters to a specific playstyle that introduces additional challenges. If you love close-range combat, slicing away big chunks of an enemy’s health and playing like a Knight of the Round Table, then the Sword is for you. Sword! Sword (Common): 690 Damage, 1.112 SPS, 767 DPS. Sword (Rare): 760 Damage, 1.112 SPS, 844 DPS. Sword (Epic): 830 Damage, 1.112 SPS, 922 DPS. Sword (Legendary): 900 Damage, 1.112 SPS, 1000 DPS. There are Legendary versions of each weapon in the game (except for the Venom Pistol) as well as unique, class-specific Legendary quality weapons. These weapons are, obviously, the “best in slot” choice for each class. It’s not an easy feat to craft these powerful weapons, as each requires a substantial amount of Shards along with Chicken Trophies. All class Legendary weapons are projectile-based with a medium to long range and feature a random Elemental affix. Generally speaking, you should prioritize crafting a Legendary Weapon as soon as possible, as there’s no other weapons that come even close in terms of damage and overall power. The class-specific Legendary weapons are unique and incredibly powerful, and Legendary versions of basic weapons feature the highest damage numbers. 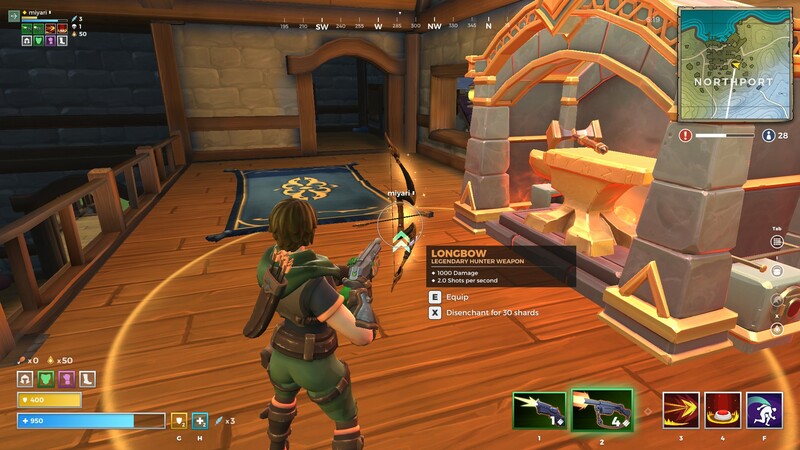 It's worth noting that your luck may change if you come across a Gold Chest (marked on the map) and manage to loot it, as they will contain a Legendary quality weapon—it could even be your class Legendary! Legendary Weapon: Require 120 Shards, 1 Chicken Trophy. Takes 60 seconds to craft. Class-specific Legendary Weapon: Require 200 Shards, 2 Chicken Trophies. Takes 60 seconds to craft. Sounds easy enough, right? Well, while using the Forge, you’re essentially stuck waiting around for your item to complete. It will take a full minute for the Legendary weapons to cook, and you’ll have only 10 seconds to grab your crafted item before a teammate is able to loot it. To make matters worse, the Forge will immediately begin spewing very noticeable smoke and make a ton of noise, which will almost certainly attract nearby enemy players hungry for some chicken. It’s important not to take trips to the Forge alone if you want to make it out alive (and with your brand new Legendary weapon in tow). Longbow (Hunter): 900 Damage, 0.5 SPS, 500 DPS. The Hunter’s Longbow is quite strong, dealing a whopping 900 damage after a relatively fast draw speed at likely the longest range in the game. It takes two full seconds to fully draw the bow, but you can fire at any point for substantial damage. If you’ve noticed there’s a ton of Hunters in your game, the Longbow is why. Plasma Launcher (Engineer): 800 Damage, 1.0 SPS, 800 DPS. The Engineer’s Plasma Launcher is unique in that it deals splash damage, offering the ability to hit multiple enemies at once. However, it is fairly weak when used at ranged and it's certainly worth noting that it will cause self-damage to the Engineer if fired at their feet, the only weapon in the game where that's the case. Sniper Rifle (Assassin): 1100 Damage, 1 SPS, 1100 DPS. The Assassin’s Sniper Rifle is the highest damage weapon in the game, righteously capable of offing lower-armored players from long range. It’s technically slower than the Longbow and features only one shot before requiring a reload, but it's remains a powerhouse weapon. Stone Spear (Mage): 350 Damage (per projectile), 1.2 SPS, 1235 DPS. The Mage’s Stone Spear fires three projectiles at once, at a ridiculously fast rate, dealing substantial damage. If you manage to land one hit, you'll likely land all three. It's extremely powerful at close range and can still keep up at medium range if your aim is good. Pairs excellently with the Fireball ability. Throwing Axe (Warrior): 900 Damage, 0.9 SPS, 720 DPS. The Warrior’s Throwing Axe is unique in that it does not have to be reloaded and has a relatively fast rate of fire. It can be a bit more difficult to effectively land hits at long-range, but if you’re up to the challenge, it’s a whole lot of fun.